I was very fortunate to be given Backsbottom Farm by my Father. This is a very beautiful area of land with a valley alongside the River Roeburn with wild flower rich hay meadows, ancient semi-natural woodland, pasture fields with wildflowers and interesting old pasture trees, and fell land (part recovering blanket bog). The farm is run in a way that benefits wildlife whenever possible. This ties in well with the Natural England Stewardship Scheme. This allows us to make the most of Caring for the Earth and provide a sanctuary for nature. This makes the farm important as a place for visitors to appreciate and learn from nature. By observing nature we can get insights into different ways of doing things - working more in harmony and connecting to our roots. The insanity of the rat race consumerism becomes clearer when we observe the simple wonders of nature. The farm is run Organically and is certified with the Soil Assocation. No artificial fertilizers, herbicides are used. No GM crops are used in the animal feed and we keep to a minimum the veterinary medicine intervention. Over the years the farm is gradually moving more towards Permaculture design. The river makes it's way through ancient, semi natural woodlands, (which are an SSSI) , wildflower rich, organic, hay fields- Biological Heritage Sites, heritage varieties of apples and plums in the orchards, and rocky gorges. The wooded area leads upwards onto open access land with some upland blanket bog. 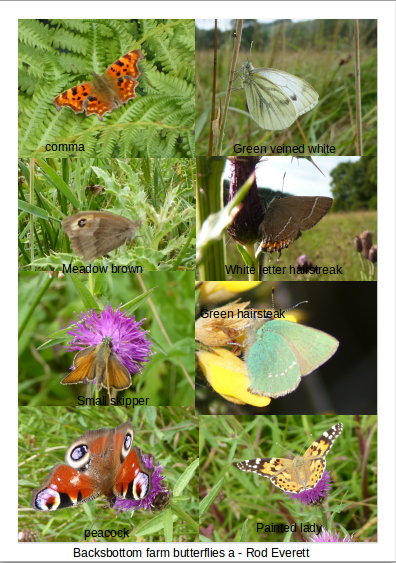 There is a fantastic range of habitats for birds, insects and flowers - the bird life includes; redstarts, nuthatches , pied flycatcher, robins, heron, buzzards, hen harriers, merlin, barn owls and curlew, snipe, oyster catchers and plovers on higher land. Deer, stoats , weasels and hares are often seen. Wildflowers give a range of scents and colours as you make your way through the woods, fells, fields and riverside. 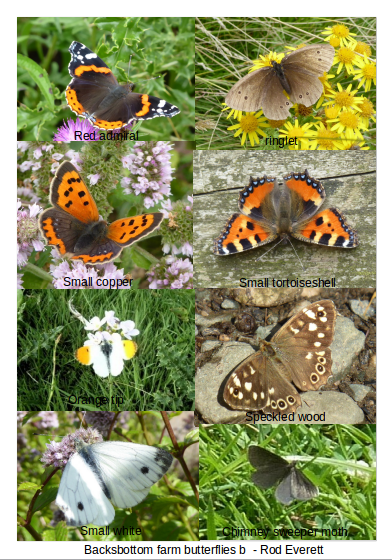 Moths and butterflies add to the abundance of this species rich valley. Lichens liverworts, mosses, fungi and ferns add to this diversity . At night owls, bats, badgers and foxes come out along with a great range of moths. We have a small shop in the car park selling a variety of apples. This is a self service shop so it is open all the time. Please visit. Apples are an important part of our Lancashire heritage with orchards common throughout the county. In Roeburndale there is now a collection of over 200 varieties of apple grown organically. The large Minshull's Crab cooking apple dates back to 1777 and grows alongside Lange's Perfection from Wigan from ??1983. Scotch Bridget is a rich ,creamy, crisp cooking apple and was common in most Lancashire orchards. Ribston Pippin, a late desert apple from Yorkshire,dates from 1707 and Annie Elizabeth, an apple that keeps until April ,has a sweet, light flavour and is esteemed as a stewing apple. (See www.rodspermaculturets.co.uk/current-projects for the Lancashire Apple Project for all the varieties).Keeping these old varieties helps maintain the genetic diversity that may be important for future local apple production. Many of these old varieties are now back in our local orchards grafted from scions from trees on the farm. Hilary Wilson and Phil Rainford, local apple experts, helped to collect the old varieties from around Lancashire and Cumbria. The first trees were planted in 1985 and the varieties have expanded each year with any unusual varieties that might be suitable for our climate. 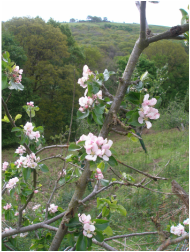 The Countryside Stewardship Scheme and Lancashire County Council have helped toset up some of the orchard areas on the farm which enhances wildlife and preserve old varieties of apples. Organic apples are good for juicing, as you can use the whole apple (less pips). This gives you a range of health benefits which offer antioxidant and anti-inflammatory properties. The American Institute for Cancer Research reports that apple peels contain a third or more of the fruit's compounds thought to be useful in fighting a variety of cancers. ARE YOU EATING TOXIC APPLES ? 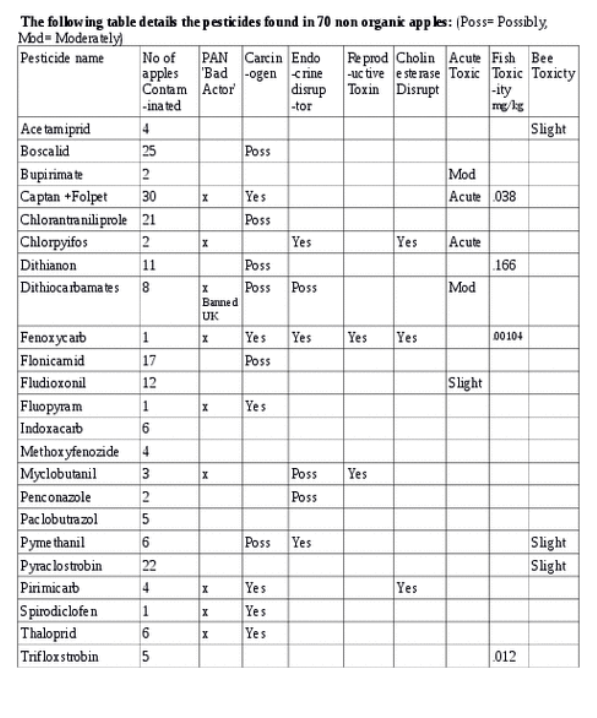 96 apple samples were tested for pesticide residues. 26 of these were organic and contained no residues. Out of the remaining 70 non organic apples, 65 contained pesticide residues. 15 apples had 2 residues, 18 had 3 residues, 13 had 4 residues, 6 had 5 residues, 4 had 6 residues, and 1 had 7 residues. The pesticides are not considered present at less than 0.01mg/kg except Captan+Folpet, Dithianon 0.02mg/kg, Dithiocarbamates, Pyrethanil 0.05mg/kg. 21 samples with Captan + Folpet would have been toxic to minnows (2 nearly 10x more concentrated). 4 samples with Diathianon would have been toxic to minnows. All 5 samples with Trifloxstrobin would have been toxic to trout. The Fenoxycarb sample would have been 50 times more toxic that the level that would kill Western mosquito fish. Yet the monitoring report concluded that none of the residues detected by the laboratory would be expected to have an effect on health!! 14 of the Captan +Folpet samples were at or above the US Department of Health maximum contaminate level! If you decide to eat organic apples to avoid these pesticides, then where do you buy them? For the samples tested the supermarket organic apples were 8 Gala, 5 Braeburn, 2 Pink Lady, 1 Jazz and 1 Santana and they came from New Zealand (8), Italy (5) Slovakia, Austria and UK (3). Where is the diversity? Where is the support for local Uk farmers? Is this really the toxic cocktail that you want to eat on a regular basis. So Eat Organic apples from UK and enjoy the flavour of many varieties. Make it a joyful experience. Make a healthy choice for your own body and for the environment.